This past weekend the relative newcomer to Modern, Modular Affinity, scaled to the top of Grand Prix Prague. 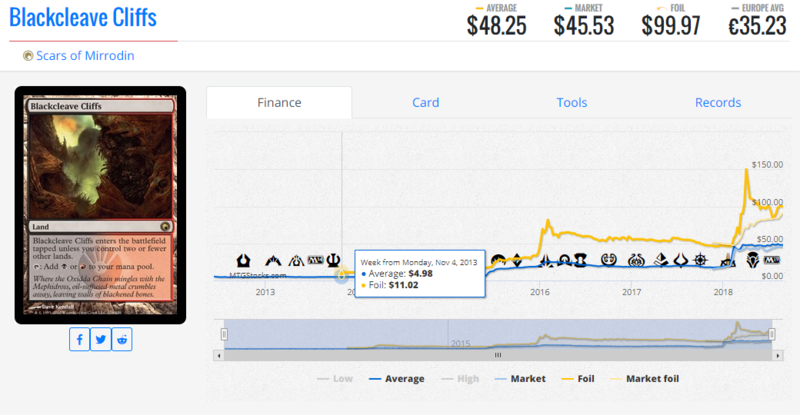 I might’ve been a bit hasty in marking the deck’s namesake card, Hardened Scales, as a “fold” in the previous article—both non-foils and foils have spiked a bit more since it took down the GP. However, I still think you should sell into the hype if you don’t plan on playing the deck because, as I mentioned, the card only sees play in this deck. I can definitely tell you the deck has legs though. I lost to it in the top four of a PPTQ on Saturday, August 25. The deck won the tournament, but his opponent who was on Grixis Shadow conceded to him. Nonetheless, it still won. And although I think Hardened Scales is a “fold,” there’s a nice “hold” in the deck that I’ll get to below. Previously, I talked about some cards to pick up for Standard as rotation nears. On the flipside, here’s a card that’s a reasonable pick-up as it rotates out of Standard. This card has skyrocketed in popularity in Modern over the past year. Most notably, it sees play as a four-of in Bridgevine and the Modular Affinity deck mentioned above. And don’t overlook Anneliese Faustino’s second-place finish with Mono-Green Tron at the SCG Baltimore Open this past weekend. The enemy-colored fastlands are also reasonable pickups through rotation since they probably won’t get reprinted for a while. Just look at the Scars of Mirrodin fastlands; they haven’t even been reprinted yet since their debut in 2010. In case you missed my earlier analysis on the Scars lands, they’re a strong candidate for a reprint soon, so I would still get rid of extra copies you’re not using and pick them back up later. Spirebluff Canal sees the most play in Modern via Storm and Wizards. And Botanical Sanctum has been lifted to stardom thanks to Bant Spirits. 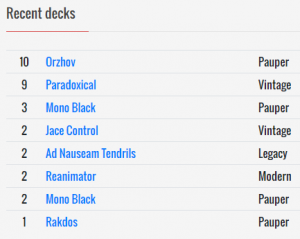 Although Steven Borakove took down the SCG Baltimore Open with UW Spirits, Ondrej Strasky and Joakim Haram both top-eighted Grand Prix Prague with Bant Spirits. Circling back to Standard cards that’ll stick around for rotation, here’s a card that doesn’t see any play outside of Modern Elves yet. But this could join forces with Llanowar Elves, Steel Leaf Champion, Druid of the Cowl, Elfhame Druid, Reclamation Sage, Thorn Lieutenant, Vivien Reid, and Karn, Scion of Urza, plus whatever else comes out in Guilds of Ravnica in October, to form a Standard Elves deck. It’s promo time again! This one is a bit pricey but worth it. Although this doesn’t beat the judge promo, it’s the next best thing to it. I imagine that Noble Hierarch will continue to get reprinted in Masters sets, which might bring the price down a bit. But the judge and RPTQ promos will just keep going up. Demand for the card is high, since it sees play as a four-of in Humans, Spirits, and Infect in Modern, as well as Infect in Legacy. There was another round of Regional Pro Tour Qualifiers this past weekend, which bumped up the supply but not by much. So if you need or want these, this is probably a safe time to pick them up. And if you have other versions besides the promos, I would dump those and move into these. I’ve had this cards in my TCGplayer cart for a while and have been close to pulling the trigger on buying them. They’ve even gone up a dollar or two since I added them to my cart months ago. 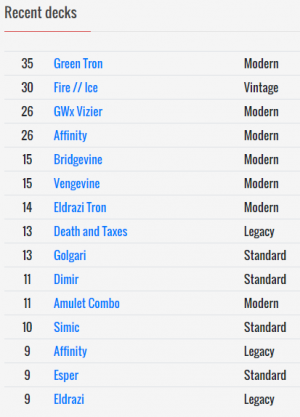 Outside of Vintage, this only really sees play in Modern’s Colorless Eldrazi which just came in ninth place at the SCG Baltimore Open. It’ll just be a matter of time before another deck comes along that looks to mulligan aggressively and/or abuse the exile zone. When that time hits, this card will see an uptick, because it’s only been printed here and in Darksteel. This card has been printed quite a few times, but there are only three foil printings: 10th Edition, Iconic Masters, and the WPN & Gateway Promo. The promo is by far the best version but is quite pricey as it hovers around $10. But you can pick up foil versions of the Iconic Masters ones on TCGplayer for around $1-2 each. This sees play as a four-of in Modern’s Ironworks Combo, which came in fourth place at Grand Prix Prague…and in multiples in Colorless Eldrazi’s cousin, Eldrazi Tron. Now it’s time for some Pauper action! If you stay current with Magic Online results, you’ll know that this card pops up quite a bit. But the nice thing about Night’s Whisper is that it also sees play as a four-of in Modern’s Grishoalbrand. I noticed that this version of Force Spike’s stock is low or nonexistent on Card Kingdom, Star City Games, and Channel Fireball. I might just have a soft spot for this card owing the glory days of Mono-Blue Control in the late 90s, because this card doesn’t really see any play in Legacy or Pauper. That’s why I haven’t pulled the trigger on buying these even though it’s a sweet promo. I decided to create this section for cards like this; and to take it a step further, I’ve created a publicly shared spreadsheet which you can bookmark to help you stay current with the cards I mention in my articles on the fly. As a pedantic side note, Eldrazi Tron doesn’t run Serum Powder, the deck is generally referred to as Colorless Eldrazi or Serum Powder Eldrazi. Aside from that super minor quibble, very good insight overall.